As regular readers know, we've been running the AGoogleADay.com site for around 14 months. The goal is to provide a daily search puzzle for you to fiddle with and test your search skills. Each day is a new question, with hints and a complete search solution path. One of our other objectives was to provide a resource for teachers to use in their classrooms when teaching research skills or critical thinking. Recently, we made a short video that illustrates how to use the AGoogleADay questions in the classroom. It's not a prescription, but a hint about some fun ways to use the site to get students interested in how to do research on any of the broad range of skills that we support. At the ISTE conference we also handed out a few thousand booklets of AGoogleADay questions (with answers, hints and background reading) for teachers and instructional technology folks. We still have a few hundred left. If you'd like one, fill out the form below and we'll send them out until they're gone. Answer: What's the connection between President McKinley's assassin and "free love"? Editor's update: Note that I made an error in this post that I have noted in an Erratum note (8/25/14). Leon Czolgosz was never a member of the Oneida Colony. Click here to see the full post-mortem analysis of what I did wrong. "Free love"? Wasn't that the catchphrase of the 1960's? Well, no, actually, it's a phrase from the 1860s. And that observation is what made me start wondering where ideas come from, how they're connected to present. So, how does one find a connection between different, apparently wildly different ideas? In his brilliant series of PBS television shows, Connections, historian of science James Burke would show how a long (and apparently implausible) series of connections would link one technological invention with basic discoveries made elsewhere in time and distant. In essence, when we're looking for connections of our own, the best strategy is to search for a meeting point from both ends and look for common ground in the middle. How does that play out for this question? Let's start with the idea of "free love" as a commonly used phrase. While the idea of free love has been around for a long, long time, the modern common usage can be traced back fairly easily. leads quickly to either Christian socialist writer and religious leader John Humphrey Noyes (1811 - 1886) or to Austrian psychiatrist Wilhelm Reich (1897 – 1957). Since Noyes was the earlier of the two, I started with him. Searching inside of the Google News Archives, it was simple enough to find multiple references (especially in his obituaries) to his use of the phrase "free love." And then a quick look in Google Books for [ Noyes "free love" ] lead me to Without Sin: The Life and Death of the Oneida Community, Spencer Klaw (1994) where you can find that "in the late summer of 1852, in an article in the Circular [the Colony’s newsletter] he [Noyes] boldly included “Cultivation of Free Love” in a list of principles that the community stood for." That seems pretty definitive to me. 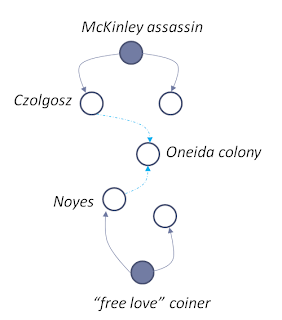 I read a bit about Noyes, then suspended work on that end of the connection to figure out how to link Noyes with McKinley's assassin. 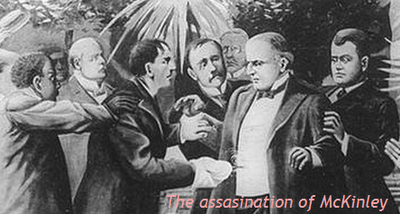 leads to Leon Czolgosz, who shot President McKinley at Pan-American Exposition reception on September 6, 1901. Czolgosz, a native of Michigan and an avowed radical anarchist ( who hung out with people like Emma Goldman) was, for a short time, a member of the Oneida Colony. Wait. Hadn't I just seen something about Oneida when reading about Noyes? Yes, John Humphrey Noyes, was the founder of the Oneida Colony, a community that advocated Biblically-based communism, group-marriage, and used the term “free love” (which they also called “complex marriage”) to describe what they believed was the proper organization of men and women in an open, group marriage. Interestingly, the Oneida Colony was one of the few successful utopian communities (lasting for just over 30 years) in the US. 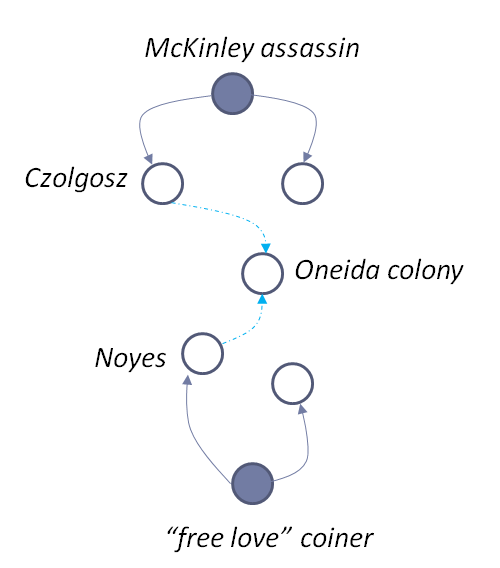 But there's the connection: Czolgosz was briefly a member of the Oneida Colony (where, apparently, he did not fit in especially well), where free love was practiced as a policy for Noyes' complex marriage. Interestingly enough, the assassin of President Garfield, Charles Julius Guiteau, was also a member of the Oneida colony. Suggesting, perhaps, that free love wasn't enough to prevent homicide in the first degree. Search lesson: Here's a diagram that might help explain my process. I started at the bottom node ("free love" coiner) and in reading around, found that it was Noyes. I then switched to exploring from the top, working on the McKinley assassin and finding Czolgosz. This wasn't especially hard--the common idea ("Oneida colony") was in the overlap between the two topics. Naturally, longer chains of connections are harder to ferret out as the number of nodes between the two gets larger and larger rather quickly. When doing this kind of research, keeping a notebook with common topics, places, and people you run across can be handy. Wednesday search challenge (7/25/12): What's the connection between President McKinley and "free love"? (medium) What is the connection between William McKinley’s assassin and the person who coined the phrase “free love”? What I'm curious about is how you'd follow the thread of connections from one idea (the guy who assassinated McKinley) to another idea that's pretty far afield (or so you'd think). The links between the ideas are fairly interesting... and surprising! Think like an investigative reporter and you shouldn't have too much trouble. As usual, let us know how long it took you, and what searches you did to find the links from A to B.
I'm looking for a few people who'd like to be volunteers to help do a few studies every now and then. As you know, my primary research interest is on the topic of "how people search and use information." And every so often I run online studies with volunteers. You don't have to come into our lab, just answer a few questions, maybe do a simple search task, things like that. If that sounds like something you might like to do (you can do as many, or as little, as you like), please sign up here to become part of Dan's SearchResearch Cadre (DSRC). There will even be opportunities to get very rare t-shirts! 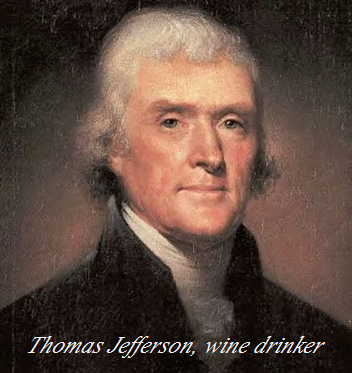 Answer: How much did Thomas Jefferson think about wine? 1. Dr. Vine Utley of Lyme, CT was the correspondent. 2. The house is (as of Sep 2009) white. 3. Jefferson wrote the word "wine" 267 times in his lifetime. Why that particular phrase to search? Answer: I knew it would have to be Jefferson, and this particular construction "half of wine" and "even treble it with a friend" would be idiosyncratic enough to pop out on the search. Thing is, when I did that, I found a bunch of "wine quotes," which suggest that Jefferson did say it, but it took a little more digging to find an authoritative source (and the rest of the letter, so I could see who he was writing to). So I thought I'd search on Google Books and see if there wasn't a collection of his letters. Sure enough, there's a very nice collection: Memoirs, Correspondence and Private Papers of Thomas Jefferson, Volume 4 (published by Colburn & Bentley, 1829)--that contains the text of Jefferson's letter to Dr. Vine Utley on March 21, 1819 from Monticello. Okay, so who IS this Dr. Utley person? And where did he live? Since I'd never heard of Vine Utley before, I started with a simple query on his name. After all, how common can "Vine Utley" be? 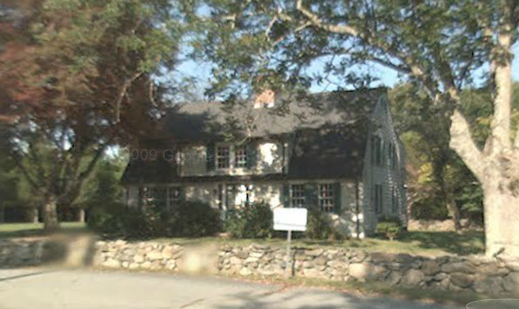 With the lat/long in hand (41°19'53"N 72°13'32"W) and a bit of Google Maps + Streetview, it didn't take long to get a nice picture of the house from street and verify that it is (as of Sept 2009) a white house. As I said, this is a bit more difficult. I thought I'd start by finding books of Jefferson's correspondence in Google Books--and yes, I can find them easily enough--but it's difficult to be sure you've got them ALL of his collected writings. Even then, Google Books often is inconsistent about it's "Find within this book" feature. For instance, if you search within this book (Volume 4 of his collection) for the word "wine," it will show you one instance of the word in the text. But simple browsing around within the text will show that this isn't the case. So we must go deeper. The simplest solution I could think of was to find a collection of Jefferson's writings and then do a regular text search through that. This comes under the category of downloading and scraping content from web sites (which we'll discuss later in more detail), but for this problem here's what I did. a. Find a collection of ALL of Jefferson's writings in plain text. c. Do a textual search for "wine" throughout his collected text (by using Control-F, Command-F, or if you're geeky, grep). a. Find a collection: Easy. [ Thomas Jefferson collected writings ] quickly leads you to the marvelous History1700s.com, a site with lots of collected works--and in our case, the works of Jefferson in 19 handy plain text files. which will grab all of those text files in one operation. Once you have all 19 files, you can just concatenate them together (using the Linux cat operation) to create one big file. I called in Jeff-full.txt, and it's 14.3Mb long. But, it's there, in his writings, so we need to count those prosaic references as well. As you can see by the comments in yesterday's post, there were many answers to this question. Of course, there's really only one answer--but bear in mind that even that might change over time. I can easily imagine that there's a trove of Jeffersonian letters that has yet to be discovered. So we'll stop here, with our discovery that Jefferson seems to have written the word "wine" at least 267 times throughout his life. Search lessons: Sometimes you have to download the data and do a bit of processing yourself. In such cases, you really need to have a basic set of tools to help you find what you need, and then process it in some useful way. We'll talk more about this later, but remember that although the web is a wonderful place, not all answers are out there to be picked up like beautiful stones on the beach. You still need to dig for the information clams! 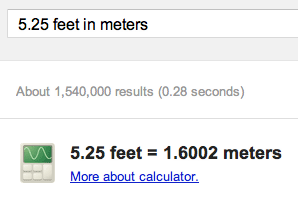 The problem with being overly precise -- it may limit your results! I wanted to follow up on a comment by one of our readers from Wednesday's challenge. Using Worldcat via Google books does not in fact give you the full results of who holds a particular book. Many libraries (mostly corporate) will not show up in the public version of Worldcat and you will need to ask your local library to help get you the full list. You also need to search Worldcat itself rather than use the Google books find in a library feature as it will often take you to one catalog record when there is in fact several records and one has more holdings than the other. This is due to different libraries cataloging it slightly differently or it may be that there is a reprint of the book. If you click on the "Find in a library" link, it will, in fact, connect you to WorldCat and try to find EXACTLY that version of the book. 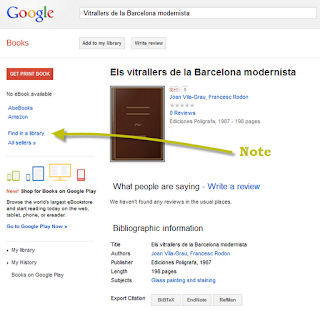 That is, Google Books hands a hyper-specific query to WorldCat (in particular, the Ediciones Poligrafa, © 1987). That's fine as far as it goes, but there's only one version of that book in the WorldCat system--and it's in Puerto Rico! Instead, as Kiltedcap points out, it's often a good idea to THEN use WorldCat to search for the title of the book (and not the hyper-precise book title + author + edition, which is what Google Books is handing to WorldCat as the query). Once you do that, you'll find that there are 4 slightly varying bibliographic records for the book. (In truth, it's all the same book.) But you need to know that backing up and searching on just the title will sometimes yield much better--and in my case, much more local--results. I’m impressed by all of the people who found the book so quickly and (interestingly) MUCH more easily than I did. Where’s the window? As several of you pointed out, it’s not difficult to figure out that this stained glass window is in La Sagrada Familia, the church under construction in Barcelona, Spain. At least one person found this step difficult because they dragged the image to the desktop rather than doing a Save-As of the full image. Hint: When doing an image search, use a good size, high quality image. 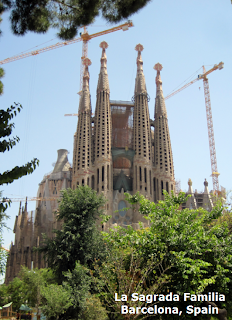 Now that you know it’s from La Sagrada, the next question is to find who designed the stained glass. 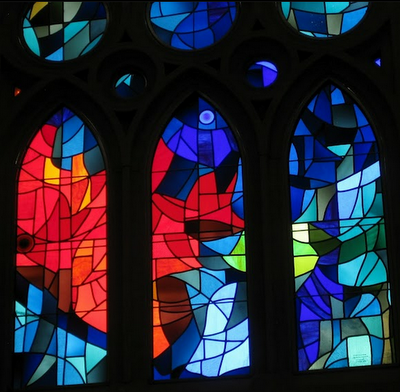 Several people automatically assumed that the stained glass was also designed by the church architect, Gaudí, but that’s not the case. I thought that this would be somewhat more authoritative than the English version of the Wikipedia entry, so I read through the article and found this phrase: “…siendo autor de Los vidrieros de la Barcelona modernista (1982)” That is, “.. he is the author of “The Glassmakers of Modern Barcelona." Now, I knew enough to know that “modernista” is actually a reference to the Spanish Modernisme (or Modernista) design movement (a bit like Art Noveau or Jugendstihl movements), so the translation into “modern Barcelona” didn’t bother me much. Much to my surprise, if you do THAT search, there are many references in Spanish, but you can’t find a book by that title. Sure, I searched Google Books—nothing. I searched Amazon and various library catalogs—nothing. I kept hammering away on this and failed failed failed. I finally wrote to a friend at the Library of Congress who immediately pointed out my problem: “Your title is mixed languages, vidrieros is Spanish.... Try searching this title: ‘Els Vitrallers de la Barcelona Modernista’.” I did that search, and voila, LOTS of copies can be found—even on Amazon. Knowing a little Spanish can be blinding. I knew that Grau is Catalan, and that the Wikipedia entry was in Spanish, but I’d incorrectly assumed that NOBODY would translate a book title from the original. My mistake. And it cost me several hours while I futzed around with that mistaken identity. Finding a local copy: As many of you know, WorldCat is a service provided by OCLC (Online Library Computer Center) which provides a wonderful meta-catalog for many of the world’s libraries. That means you can use WorldCat to search over many thousands of library catalogs for a book (and other kinds of materials as well). IN PARTICULAR you can put in your zip code and have it search libraries near your house for the book you seek. First off, my big problem was that I ratholed on a bad version of the title. I should have realized after 30 minutes or so that there was a problem with the original title. It’s not that the Spanish Wikipedia entry is wrong, it’s just been translated from Catalan to Spanish (“Los Vidrieros” to “‘Els Vitrallers”) which changes enough words to make all my searches fail. Perhaps every reader of the Spanish Wikipedia realizes this; but I, as a non-native semi-literate Spanish reader, didn’t. Don’t rathole. When you’re failing repeatedly, try a different strategy. As all of the comments showed, there are several other strategies that work really well. Secondly, sometimes you just need to know what tools (and capabilities) are available. 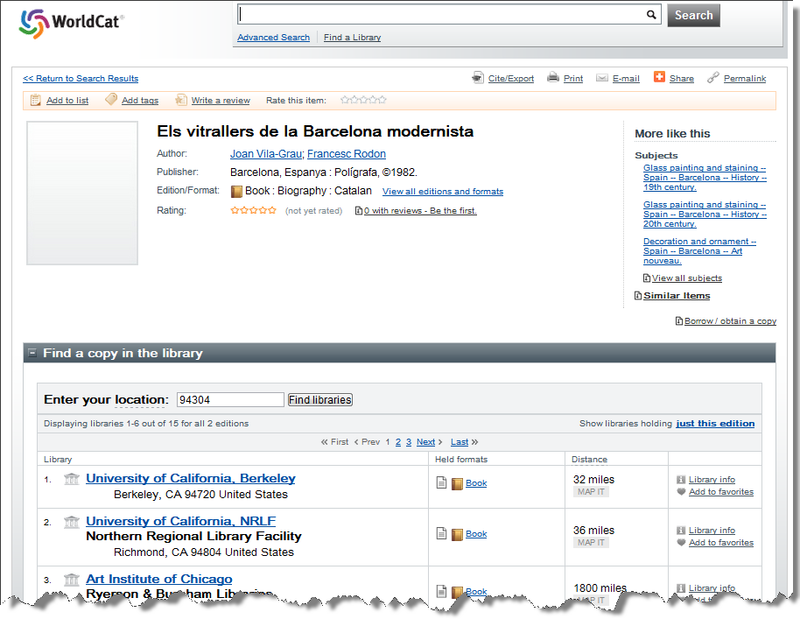 You need to know about WorldCat and it’s “find in a library” function. Some readers were successful by looking up libraries in the Mountain View zip code and checking their catalogs manually—that’s a good strategy (albeit slower). In the same way you just have-to-know about seach-by-image, you have to know that databases like WorldCat exist. (Easy) What is the name of our mystery man? pretty quickly leads to Tadeusz Kościuszko, the man who seems to statues to him everywhere I go. Oddly, I'd only heard of him tangentially in my reading of US history, which is sad, as he seems to have been quite a character on multiple history stages. (Moderate) What is the monument to the man who tried to sell off the fort that was fortified by our mystery man? If you search for [Tadeusz Kościuszko fortifications] or [ Tadeusz Kościuszko fort] you'll also fairly easily find results that indicate it was West Point. Reading the Wikipedia entry on West Point article tells the story of his the construction of the defenses of the garrison (the name was later changed to Fort Clinton). A search for [ Benedict Arnold monument ] reveals a number of plaques and markers, but the only real monument to the man is the "Boot Monument" that commemorates Major General Benedict Arnold's service at the Battles of Saratoga in the Continental Army, but contrives not to name him. It lauds the actions, but not the man. The Tadeusz Kościuszko Wikipedia article included an entry for about the polonaise he composed. A quick search for "Polonez Kościuszki" reveals the lyrics in Polish, although the lyrics are written by Rajnold Suchodolski. So it IS possible to be a patriot in multiple countries, be a musician, and an engineer. Kościuszko is a man well worth remembering during our long weekend of national historical reflection and patriotism. And the search lesson? Keep following the trail, where ever it leads. 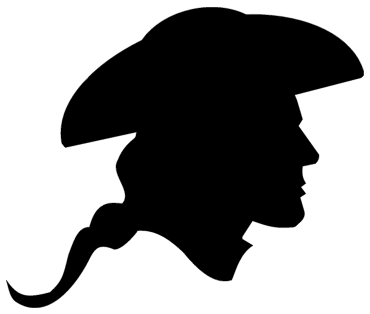 Wednesday Search Challenge (7/4/11): Who is the mystery man? Having travelled fairly widely, I’ve been impressed by a name and face that keep recurring—there seem to be statues to this guy everywhere I visit! This man of mystery is vastly underrated and under-remembered in our national memory. But the remarkable thing is that he’s the only person I know who is a national hero in Poland, Lithuania, Belarus, AND the United States! He has an impressive career and made many key contributions to engineering in the United States, including improving a key fort’s defenses. As usual, please let us know HOW you found the answer and HOW LONG it took you to come up with it! Special announcement: Reminder.... I'm teaching a special online "Power Searching with Google" class beginning on July 10th. The class will be 6 classes long and featuring short videos, lots of examples and more search activities. If you like this blog's Search Challenge feature, you'll probably enjoy the class. One of the best tricks I know about internet searching is the use of context terms. That's a term I invented, it doesn't have any particular function in the search engine, but takes advantage of the co-occurrence of words on a given topic. 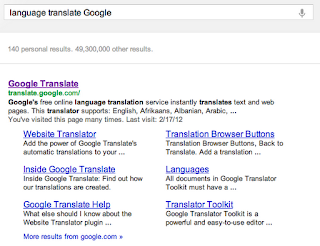 Often I find myself wanting to look up some particular Google tool or service. As you know, Google has a LOT of different functions (see Wikipedia's list of Google products)--Google has everything from document editing and spreadsheets up through language translation services, operating systems, and 3D models. So, how do I find a given Google service? Hint: I do NOT have a giant bookmark list, nor do I try to remember all of those URLs. 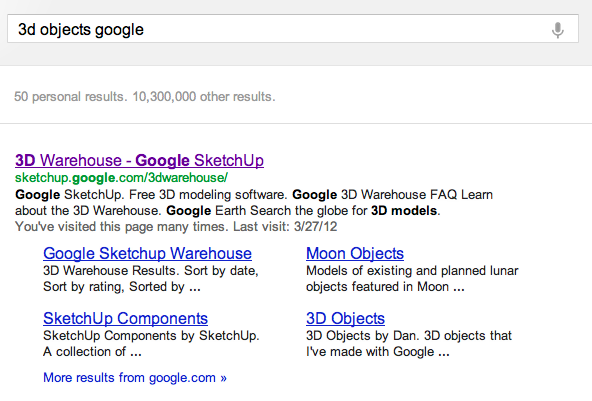 Answer: I use the term "Google" as a context term to find the Google product. 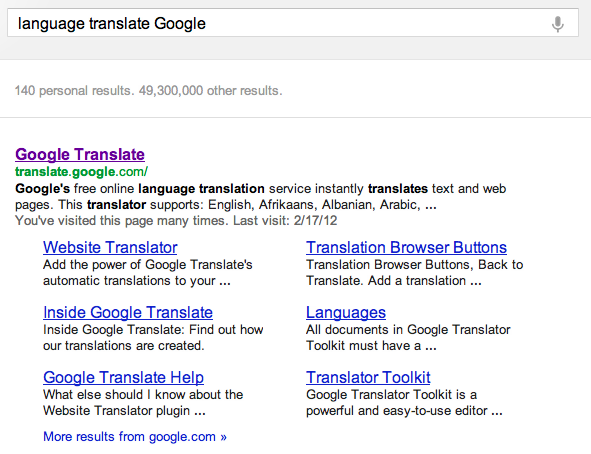 Example: I remember that Google has a between-language translation service. Is it translate.Google.com or google.com/translate or... what? 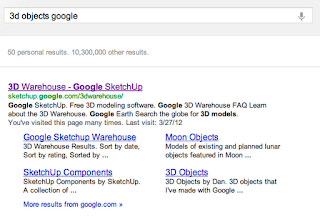 gives you a set of links to Google's 3D Warehouse (a name that's not 100% obvious). I use context terms quite a bit when searching for a particular kind of thing that is proving elusive in my search. A simple example that springs to mind--adding the term "album" when looking for collections of pictures. Now I'm curious.... what "context terms" do you use in your searches and why? ... and discover that 33C is pretty warm. And if you're a regular reader, you know that Google handles most units--English system weights and lengths, temperatures, metric volumes / lengths / etc etc. But a nice trick for teachers to know is how to make something personally relevant to your student. 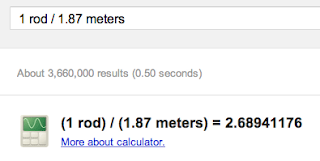 and find it's 1.6 meters. NOW... suppose you're teaching the concept of a "league" (as in the title of Jules Verne's epic "Twenty Thousand Leagues Under the Sea"). One way to make this personally relevant is to convert 1 league into "student lengths." 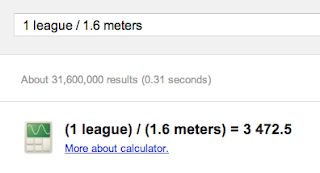 You can also show the basic algebra to illustrate why 3,472.5 is the number of "student lengths" in 1 league. But it's nice to know that you can use this little trick to convert from any unit into appropriate other units... including personally relevant ones. I'll forever remember that 1 rod is 2.68 "Dans" high!